Anyone that knows me knows that I love quality writing instruments. The workmanship coming for Montegrappa fits that standard on every level. Montegrappa is Italy’s most revered manufacturer of fine writing instruments and they have recently announced the second luxury pen in their “Icons” series that commemorates the 70th birthday of the martial arts marvel – Bruce Lee. 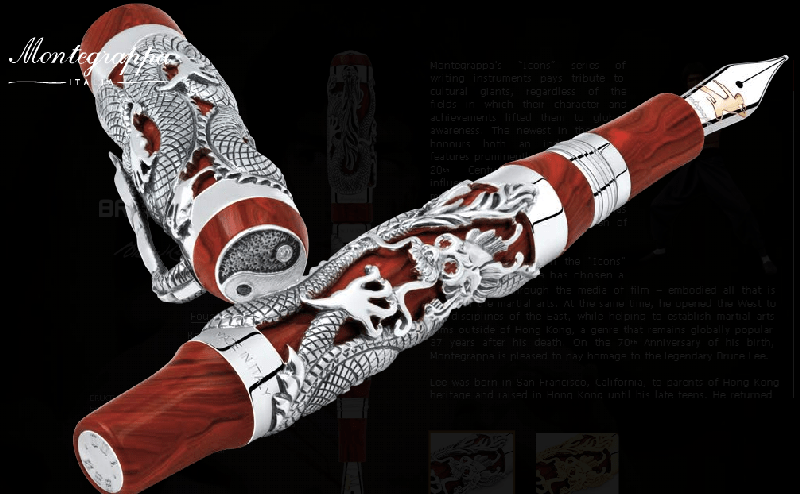 The original “Dragon” was first produced by Montegrappa 15 years ago. 1,912 pieces where made available to celebrate its founding year. The luxury “Dragon” pen was produced in black mother-of-pearl celluloid and sterling silver and only 100 fountain pens were issued in 18K gold. The pen had a piston filling system, and was available with nibs in six widths. These pens can now be found solely – and rarely – in collecting circles. The new “The Dragon 2010 Bruce Lee” limited edition series pen is distinguished from the 1995 version by a change in the design of the pocket clip, a new color, the detail of the Dragon’s tail on the pen barrel, the fountain pen nib and the top of the cap. Prices for “The Dragon 2010 Bruce Lee” limited edition series range from $4,675 to $102,200 with the ultra-rare, three-piece set retailing at $290,550. If you have that sort of extra cash available, head over to www.montegrappa.com to learn more about Montegrappa’s hand-crafted fine pens. Bruce Lee should respawn and stab them all in the eyes using their pens. Ha – love it ! !